4-piece travel DE safety razor with a chrome plated finish. Supplied in a leather case. 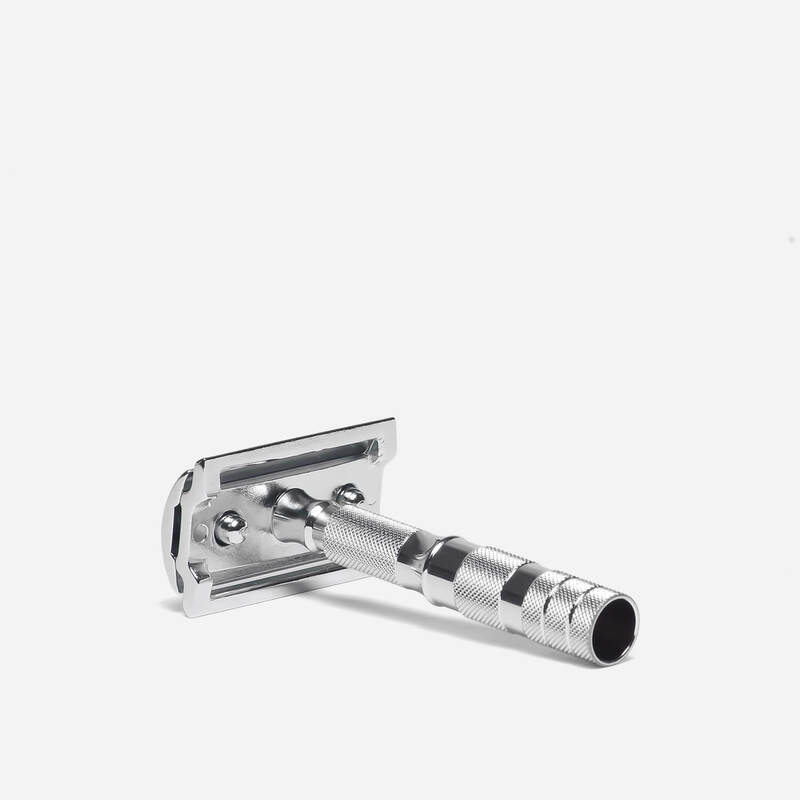 The Merkur 933 is a 4-piece DE safety razor that is perfect for travel use. 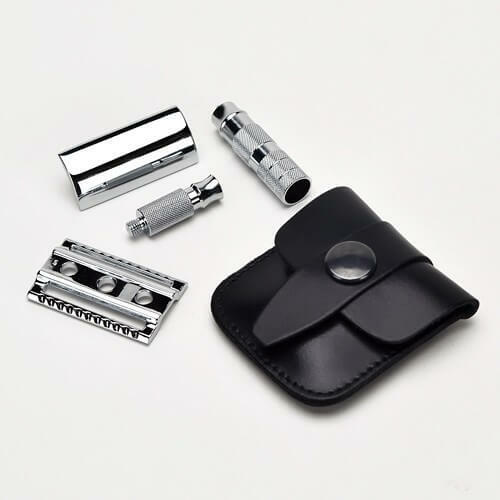 The razor can be broken down into 4 pieces (two handle pieces, base plate and top cap) and stored in the supplied black leather case when not in use. The leather case measures 57 x 63 x 23mm, so it takes up minimal space in wash bags or travel luggage. The leather case is fastened with a pop-stud. The razor has a closed comb DE safety head which offers a mild yet close shave and features knurling on the handle for added grip. The razor is plated with polished chrome. A great little travel razor used with insanely sharp Feather hi-stainless platinum coated blades. The addition of a second solid section of the handle (obtained from Merkur) converts the Merkur 933 into a long three-section-handled razor when used at home; note that the additional piece of handle will not fit in the travel pouch. The plastic razor head cover from Muhle fits the Merkur 933 perfectly to protect the blade edge at home and when stored in the tiny leather Merkur travel pouch. I received today a safety razor Merkur travel 933. It’s a good razor, I wanted to have a razor in 4 pieces because I have already Merkur 23C and Merkur 25 C. I don’t know if the case it’s really leather but it’s very nice. It is a pleasure to collaborate with Shave Lounge, greeting service! I’m a long term Mekur Futur user but wanted something small and compact for travel. Despite the fact that pretty much any DE razor will fit any reasonable wash bag, this does pack up really neatly and takes up almost no more space than a couple of packs of razor blades. The bag could actually be a big bigger, I can see why some might want to use it to store their blades as well, but it isn’t really practical for that. Despite it’s tiny size and weight, I actually get a pretty decent shave out of it. I won’t be making it my primary razor any time soon, but it’s good and it’s cheap and serves the purpose that I bought it for. If you want a razor for regular home use, I’d suggest getting something with a bigger handle instead. Excellent razor. Impressive shave but very forgiving, important in a travel razor to spare the blood letting. Breaks down into 4 parts, all fitting into the compact leather pouch. Would have given it 5 stars but the design of the head makes it difficult to clean the blade plate thoroughly without dissembling (head is interchangeable with the Edwin Jagger) and the pouch is too small to hold a pack of blades, just 2 or 3 individual blades in wrappers. A very well engineered product in a tiny case. Absolutely ideal for travel. Almost good enough to use on a daily basis. After a long break i.e. using disposables, I have re-entered the world of proper shaving. A great little bit of kit which took me back to my youth when I learnt to shave with a DE razor. I could feel the difference from the first shave, a quality razor. I will be experimenting with blades other than the Derby’s as I am sure there is a combination out there that will suit me better. All in all very pleased with the product and Shave Lounge service. I bought this for my travel washbag. I work away from home regularly so will use it most weeks. Arguably a normal razor would be fine unless you’re obsessed about size and weight in your packing. I wanted a separate shave kit in my overnight bag and reasoned that this would be as suitable as any other and ideal for camping etc. My everday razor is a Futur so this is much smaller and lighter. I don’t have any difficulty using the shorter handle but the balance and weight were a little challenging. Mine has the closed comb which is supposed to be milder but until I was several shaves in and better with angle and pressure control I had some razor burn. My only upset was that the blade in use couldn’t be left in the head as it gets damaged by the handle when in the leather pouch. I sorted this though by using anM5 nut to hold the two parts of the head together with the safety bar reversed. This way the blade edges are protected. In all I’m very pleased and would recommend IF you need a small and light travel razor or you’re a collector. By the time a brush in it’s travel tube and a stick of soap is added, would an HD not just be as handy? I travel a lot with work, and this is a great little product. Yes, a standard safety razor would fit in my wash bag, but where’s the fun in that? This is actually a four piece razor, and it packs up really small. It’s a joy to assemble, and is very well engineered. The shave is great; close but smooth. Mine stays in my travel bag, but this could be your only razor. It is that good!